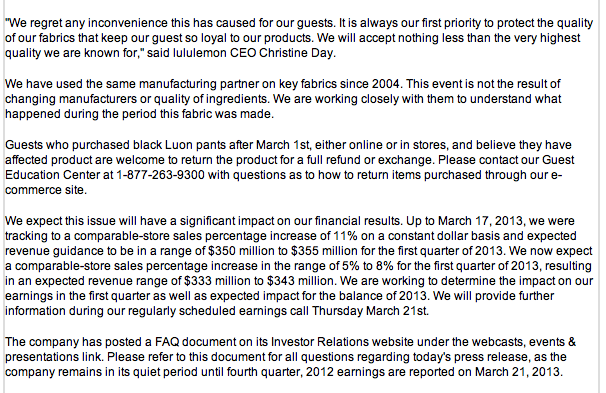 Lululemon just issued a press release prior to their March 21 Q4 earnings call. 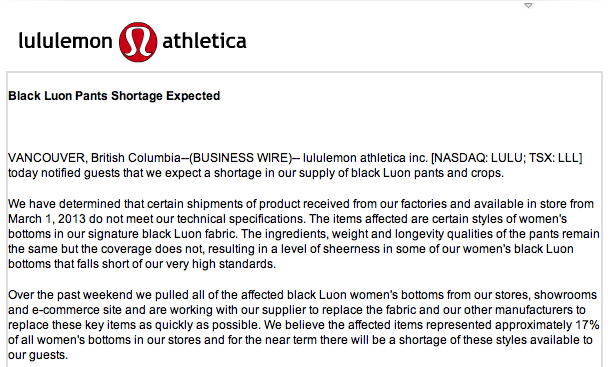 I’m curious how they will be sending this message that there are quality issues with black luon pants to customers, rather than the investors, because so far the message has ONLY been sent out to investors. I’m a bit concerned about why they have acknowledged sheerness issues with this new batch of black luon in this way, in a press release, but on their website in the past have chosen to use disclaimers about some colors being sheerer than others (burdening the consumer to ‘buyer beware’). As we customers know, sheer luon is not something new since March, but has been going on since at least last summer. What do you guys make of this?? ?